The answer is more complicated than you might think — looking at where the energy is produced and then how the energy is measured. The simple answer would be that a Net-Zero home produces as much energy as it uses. But it’s not that easy. The vast majority of homes in the U.S. are on the grid, so we will not discuss off-grid homes here. Net-Zero homes produce solar energy during the day feeding excess to the grid and then use energy from the grid at night. First and foremost, remember this mantra — reduce before you produce. This means reducing your own energy use as much as possible from increasing your insulation, to super efficient appliances and everything in between. Remember, it’s people that use the energy and unless they are buying into conservation, there is not much point in producing energy. 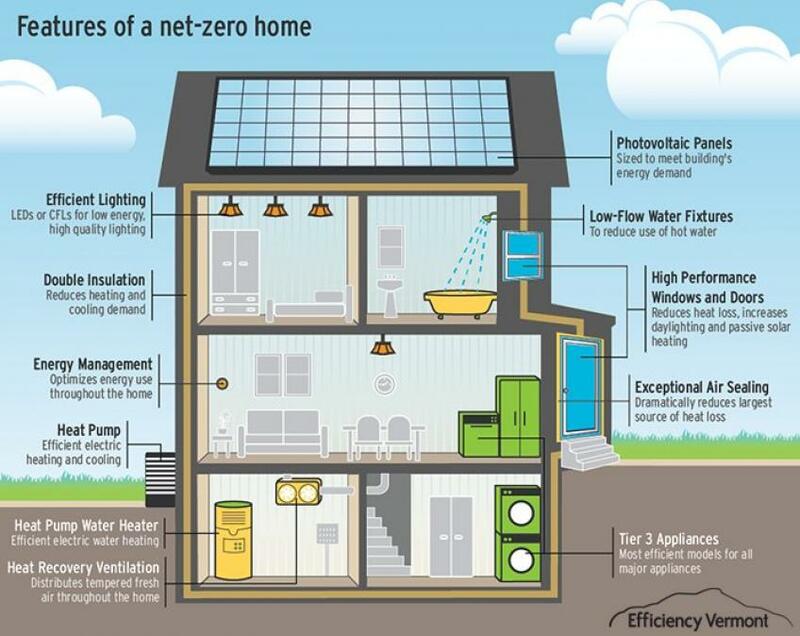 Including energy monitoring in Net-Zero homes can help owners to see how well they are doing and if there are problems that should be addressed. These are sometimes called energy dashboards. Net-Zero site energy (the amount you use equals the amount you produce) Net-Zero source energy (the amount you produce equals the amount that is consumed in delivering to you what you use. There is two-thirds energy loss in waste heat getting the electricity to you.) Net-zero energy costs (The price the utility pays you for the energy you produce equals the price you pay them for the energy they supply to you.) Net-zero energy emissions (The amount of energy you produce equals the amount you use from emissions-producing sources i.e. coal or gas fired power plants). There are even more aspects to consider. For instance, the amount of natural gas you use versus electricity makes a big difference in how much energy you would need to produce to be Net-Zero. The more electricity you use, the bigger the solar array will need to be to replace it. The more natural gas you use, the smaller the array needs to be. Also because two-thirds power is lost to heat in transmission to you, the electricity you produce is three times more valuable to the utility. All these factors effect which definition you decide to use. If you have an all-electric home and you are meeting both definitions one and two, you will be helping to eliminate the use of fossil fuels. All fossil fuels are of a limited supply and the burning of them produces green house gases. For many developers, the definition of Net-zero homes is an all-electric home with a solar array large enough to meet the demand. This choice provides greater renewable energy production and meets the truest aim of a sustainable energy future. It is likely that more power is provided to the utility during the day than needed by the house. However, keep in mind that in the case of electric heating at night, a strain is put on gas or coal fired power plants. This is another reason the choice of heating systems and insulation is so important. In the end, what is important is to make a thoughtful decision on what your goal is and how best to meet that goal, taking into consideration the climate of your location and the use pattern of the home’s inhabitants. Remember, living north isn’t an excuse to not use solar energy. Germany is one of the largest producers of solar energy in the world.